RHYS BOWEN: Another visit from an old friend today. 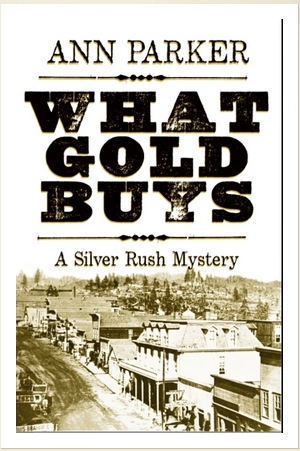 Ann is a Bay Area resident and I have enjoyed her Silver Rush mysteries since the first one was published. 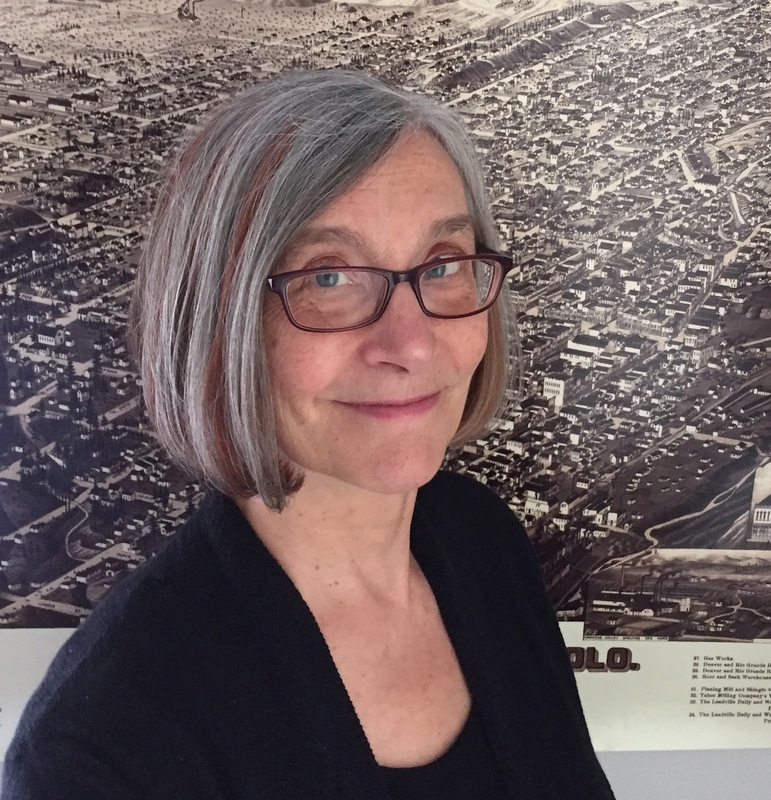 I have been impressed by her meticulous research in Colorado. If you want to read a historical mystery that is pure and true history (as well as a rattling good story) then these books are for you. 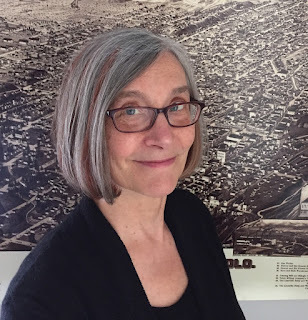 Ann Parker here, with a thank you to Rhys Bowen and the Jungle Red Writers contingent for allowing me to step in for a day to talk about one of my favorite subjects… research! When I spin my Silver Rush historical mysteries, I like to be surrounded by images and objects that capture time, place, and people. Luckily, since my era is mid- to late(ish)-nineteenth century, I can access a lot of material online, including the digital imagery from the Lake County Public Library, in Leadville, Colorado (start here http://www.lakecountypubliclibrary.org/ and click on the “Local History” tab at the top), the Denver Public Library photo collection (https://history.denverlibrary.org/photos), the Library of Congress (http://www.loc.gov/pictures/), and so on and so forth. However, nothing digital beats the “real thing,” in my view. And nothing beats the serendipitous find that sends a little shiver up the spine when spotted. Indeed, serendipity (or the sneaky workings of the unconscious) played a significant part when it came to forming the story and assembling the cast of characters. I truly hadn’t expected the “Lads from London” (a motley crew of British remittance men who first crashed the party in the fourth Silver Rush book, I already had a good handle on Terrance Epperley, who played a fairly major role in Mercury. 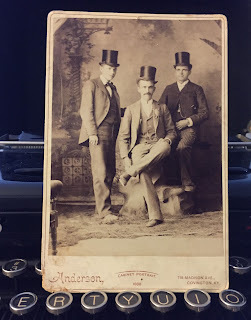 In fact, “way back when” during the research/writing phase of Mercury, I found a photo of a gentleman that was close to how I pictured Epperley and his facespanner mustache right here on a blog titled “Mustaches of the Nineteenth Century” (although I envision Epperley with a more narrow face and white-blond hair). But who were the other fellows? Now, I had to conjure up more than vague half-formed visages, since they insisted on wandering in and out of Gold and generally making a nuisance of themselves. This is where lovely serendipity walked in. I was at a tiny, local antique store (which, in addition to selling this and that and the other, just happens to sell See’s Candies, to which I have an unapologetic addiction), when I saw… THE LADS! They were properly displayed in a lovely carte de viste, resting atop a finely brushed top hat in a display case. After scooping up my weekly allowance of See’s (heavy on their “Awesome Peanut Brittle Bar” which is very very awesome), I asked if the photograph was for sale. 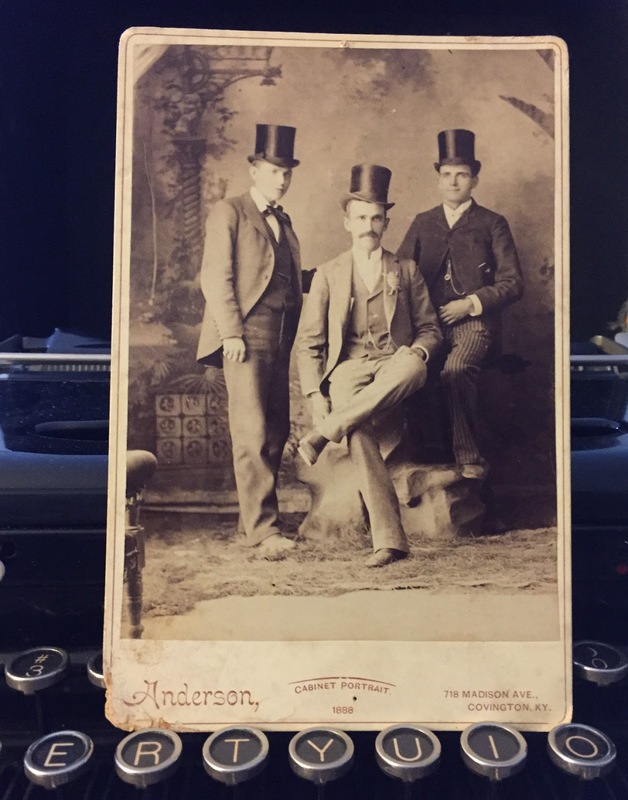 The salesperson was a little nonplussed… apparently the photo was supposed to “sell” the top hat, not vice versa. However, he checked around and finally said, yes, I could buy it. Oh, I also bought a 1940s vintage typewriter, apropos of nothing other than I had recently been paid, was feeling “flush,” and thus in a mood to throw my money around. A bit like The Lads when their remittances came in, I suppose! But that’s not the only way I burn through my research “mad money.” Online venues such as Etsy and eBay prove dangerous to my fiscal health… especially if I am searching for an image (just an image, mind you) of some object, just to get a handle on it so I can describe it more effectively. And if I’m zooming around on these come-hither-and-buy sites late at night, when my will power is weak, well, the results are as can be expected. There is something magical about holding these cards in hand. 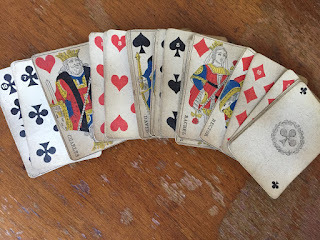 I wonder about the people who handled this deck more than a century ago, when the faces of the cards were new and unmarked—Who were these folks? Where did they live? What were their lives like? It’s all a mystery, and my imagination begins to wander… spinning tales…. And that is half the fun (and reward) of serendipitous research. RHYS: I know exactly how Ann feels about research and when you stumble upon that perfect object. I was walking along the Portobello Road in London one day when I heard a dealer say, "The bracelet is from 1930". A woman was holding it. I willed her to put it down then snatched it up myself. Georgie's bracelet! And Ann asked me to tell you that she'll give away a signed copy to one of today's commenters. Serendipity, indeed . . . research definitely keeps the tales accurate but somehow there’s nothing quite like having the opportunity to hold the object that plays a special part in the story. Only I never really thought about the difficulties that would present for the historical story writers. Rhys, I’m cheering your success in obtaining Georgie’s bracelet! And, Ann, that 1940s vintage typewriter . . . what a treasure that must be. Ah, the hunt is half the fun, Joan! And the typewriter's ribbon even works! So great! I remember Gigi playing piquet and I always wondered what it was! And, writing historical mysteries is such a difficult task… I am in awe of you and Rhys and Susan for making another world come alive. Have you seen the TV show Timeless? It's silly, and fun, but the cool part is when the main character, an historian, arrives at a time she's only dreamed and read about. I loved the look on her face when she was transported and saw a new reality. Ann, I finished reading Mercury's the last night! And loved it, of course. Also impressed with your research. A couple of characters had colorful turns of phrase. Where do you find examples of spoken language? That is one area I struggle with. Congrats on book five! Welcome Edith! So glad you enjoyed Mercury''s Rise. :-) as to conversation and phrases, I look at the newspapers of the era (which are replete with quotes) and also period books digitized on Google such as "An American Glossary" (published 1912, but with dates as to when words and phrases appeared) and "A Dictionary of English Phrases with Illustrative Sentences..." (1881). Fascinating! Piquet: Gives new meaning to not playing with a full deck. I love research, too. It's so much more fun than writing the book. Congratulations on the new book! HA! I love it, Hallie! Let's see... not playing with a full deck... first appeared in 1980. Shoot! Too late for me! Ann, I had the great good fortune of living in Colorado for a while in my younger days and fell in love with the state. As an archaeologist, I (literally) dig the past--everything from prehistoric campsites to slave cabins--the thrill never goes away when you find some 'treasure' from the past and imagine the story behind it! And now, if only I could find a way to sneak a few more hours into my days--so many new books, thanks to JRW! I will definitely be getting acquainted with The Lads! Ann, I also did not know what piquet was, besides a parlor game, and never tried to look it up before, so thanks for adding to my store of interesting facts. Your description of the remittance man led me to my own research of a childhood memory of what I thought was called that, but actually was something completely different. Who knew? Don't you love living in a time where so many arcane facts are available, if you just know where to look? Between the vast number of library sources and how much of human history is now available online, it's easy to get overwhelmed. Do you think the hard part is sifting out what is truly important? I would think there would be a temptation to include so many cool ideas and facts. Ah yes, you're absolutely right. It's a great temptation to follow every little beckoning path and include all the fascinating bits and pieces one runs across. My critique group yanks on the reins when I stray too far afield, usually with a comment such as "Fascinating! But does it further the plot?" Hmmmm. I think Serendipity is part of the writers kit, as it seems to happen both in research, and in writing. I'm sure all of us who are writers have had the experience of putting in a character who suddenly, in the second book, becomes an important part of the plot. In the same way, I find the roads I wander over doing research lead me often to exciting twists and turns on the story. Ooo, I love the Lads. Well, from a safe distance of course, because I bet they'd be terrible boyfriends. The other thing I always heard about remittance men was that they were being paid to go away and stay away. HA! You are right, Susan. Many were "encouraged" to search for another life in the "colonies," and many ended up in the U.S. West. If you are interested, there's a nice book titled "Marmalade and Whiskey: British Remittance Men in the West." How utterly marvelous those serendipities are! Rhys. I think the Forced was strong in you when you willed the woman to put down Georgie's bracelet! I love historical stories that really transport you to that time. Little details such as you mention, Ann, are important to that. But while I love the look of old fashioned typewriters, I'm glad I don't have to write a novel on one! I wrote one historical short story, set in 1942. What I learned during that period of research? I don't think I could carry it on for an entire novel! So I'm in awe of those who can. But the short story is getting published, so I must have done a decent job with what I did. Thank you, and congratulations on having your short story published, Mary! What is the title? You and I are FB friends. I recall when you sent the friend request then I saw that you and I have mutual friends like Penny. I have been meaning to read your books. One of your books is available at my library. Just discovered that my 2x great grandfather died in Otero, Colorado in 1889 though he was born in Indiana around 1852. Wonder if people were already building railroad tracks in the 1880s? And I love the photos on this blog of the Lads! My family has been living in Colorado for a few years now, and I love reading ANYTHING about it -- especially its history. We are not very far from Leadville and also the ghost town of Ashcroft, which I love to visit (it has an awesome restaurant right down the road too!). I loved reading about your methods of researching, and I can't wait to read your books. I am so glad you came to visit Jungle Reds! I like the idea of finding an object that becomes a talisman for our creative souls. "Come hither and buy sites" indeed. I have to mentally tie my hands behind my back when looking at the world's biggest yard sale (ebay). One of my great grandfather was a 49er who made and lost his fortunes by providing goods for the minors. I believe he was in CO, but am not sure. Historical fiction is so much more alive than history tomes. Thank heavens for writers who take us to the past. Ann, what a fascinating read you post is. Although I'm not an author, I love serendipitous finds and historically related objects. The piquet deck must have been absolutely thrilling. I don't have anything quite that rare in the way of cards, but I do have my parents' old Rook deck, and I'm rather taken with it. Your books sound so interesting, and I'm so happy to have learned about them today. I look forward to exploring those. Hello Kathy... Oooooh a Rook deck! I had to go look that up. Derived from the French tarot deck? Interesting. Now *I* learned something new. Thank you! Hope you enjoy the Silver Rush series! I must laugh! I always thought a remittance man was someone who collected debts. Now I find he is more or less a trust fund baby! Your books sound fascinating. I love historical fiction. We were just in Colorado last month and visited Cripple Creek at my behest. Ann, it's called "Home Front Homicide" (written under my pen name, Liz Milliron) and it'll be in next year's Malice Domestic anthology along with so many great authors I still can't believe I'm in there! It's a WWII story based loosely on my grandmother's experiences with Bell Aircraft in Buffalo during the war. Soo happy to see this book is out. I have been waiting for it and worrying that the series would enc. Oh dear... fumble fingers with the iPhone re: Cripple Creek. "Gomd Tush" = "Gold Rush." Yes, it was a looooong time between MERCURY'S RISE and WHAT GOLD BUYS. However, the series continues... life's hiccups got in the way, hence the long (inadvertent) hiatus.